Hydrogen holds promise as an inexpensive form of clean energy, but finding an efficient and affordable way to produce the fuel from water—a technique known as water-splitting—remains a key scientific challenge. 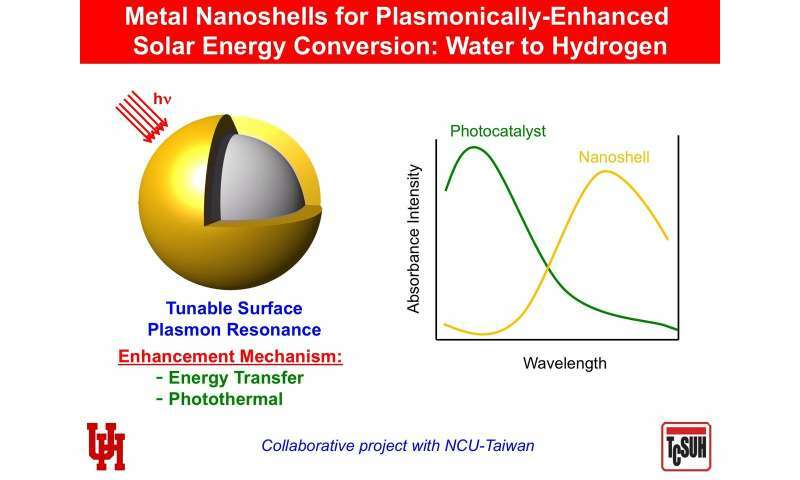 T. Randall Lee, Cullen Distinguished University Chair in chemistry and associate dean for research in the UH College of Natural Sciences and Mathematics, said the nanoshells allow the composite photocatalyst system to absorb a wider spectrum of available light, enhancing the ability of the photocatalyst to separate hydrogen from the water, leaving only oxygen as the byproduct. Most hydrogen today is produced through steam methane reforming and coal gasification, methods that lack portability and raise the fuel's carbon footprint despite the fact that it burns cleanly. Being able to produce hydrogen reliably and cheaply using only water and sunlight would be a major breakthrough. Lee's laboratory focuses on nanoparticles, nanoscale thin films and coatings and other nanomaterials for the energy and health care industries, while Tai-Chou Lee—the two are not related—works in photocatalysis, using light to trigger a chemical change. UH's Lee said putting the two together—using surface-modified hollow gold-silver nanoshells to boost the efficiency of Tai-Chou Lee's catalyst—is a marriage of fundamental research with an end application. "If you can use sunshine to generate fuel from water, that's a really clean source of energy," said Lee.